Illegal (w/Edward G. Robinson and DeForest Kelley, 1955). In Illegal, district attorney Edward G. Robinson convicts an innocent man (DeForest Kelley) and becomes entangled with racketeers. 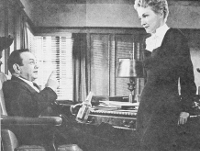 Costars include Nina Foch, Hugh Marlowe, Edward Platt (of Get Smart fame), and Jayne Mansfield. The director is Lewis Allen (The Uninvited, The Unseen, Appointment with Danger, etc.). 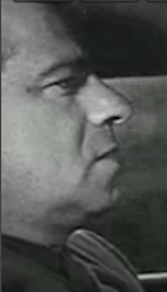 One of the film's screenwriters is W. R. Burnett (Little Caesar, High Sierra, etc. ), adapting Frank J. Collins's play The Mouthpiece (allegedly based on William J. Fallon, a former Westchester [NY] prosecutor and lawyer for Arnold Rothstein and Nicky Arnstein, who was dubbed "The Great Mouthpiece" by the press). 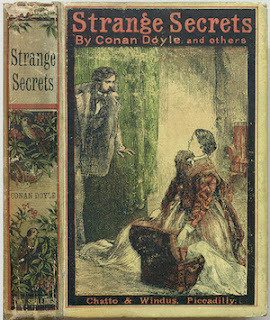 Since I last posted about the Westminster Detective Library—the effort by Edgar winner LeRoy Lad Panek (Introduction to the Detective Story) and Mary Bendel-Simso (McDaniel College, MD) to compile an online repository of short detective works published in the United States prior to 1891, some 300 pieces have been added, and there is a new Web interface. The pieces include 87 stories by 48 female authors, and Panek states, "There are no doubt many more as the majority of the stories we have cataloged have no author listed in the original." Panek also notes that he and Bendel-Simso will be issuing a book based on the works in the library. For the project, Panek and Bendel-Simso seek help from students and others with tasks such as editing, proofreading, and locating materials; clues to finding additional stories and sources; and comments on the materials in the library. Contact Bendel-Simso. 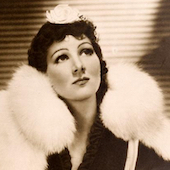 Jean Parker plays the title role in this screwball mystery, seeking the murderer of her crooked boss. "The Artists Who Make Argosy." In advance of July's PulpFest in Columbus, OH, Mike Chomko gives a preview of "The Artists Who Make Argosy," the upcoming session with David Saunders that will celebrate the contributing artists to the legendary pulp magazine launched in 1882. 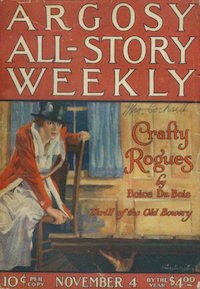 The magazine's contributing writers included Max Brand, Norbert Davis, Erle Stanley Gardner, Robert E. Howard, Mary Roberts Rinehart, and Cornell Woolrich. Saunders is the son of illustrator Norman Saunders. "The Kids Who Knew Too Much" (1980). This episode for Walt Disney's Wonderful World of Color is based on The Whisper in the Gloom by Nicholas Blake (aka poet Cecil Day-Lewis) and features a band of smart kids and Sharon Gless looking into a murder and discovering ties to a political conspiracy. It is bittersweet to see the gifted actress Dana Hill (Shoot the Moon, Cross Creek, etc. ), who died much too young at age 32 from diabetes-related complications. Intl Centre for Victorian Women Writers. There's a newish International Centre for Victorian Women Writers at Canterbury Christ Church University in the United Kingdom; one focus is crime and sensation fiction (especially by Mary Elizabeth Braddon). The center, which seeks to be a nexus for researchers on the writing of Victorian women and is hosting conferences and projects, is seeking information on birthdays of Victorian female writers for a list it is compiling. Gangster Story (dir. Walter Matthau, 1959). This low-budget, somewhat stilted film is the only one directed by Walter Matthau, who also stars as a wanted man who becomes involved with a crime syndicate. 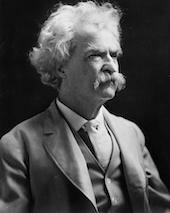 His co-star is his real-life wife, Carol Grace (who was previously married to William Saroyan). Thomas Fisher Rare Book Library, Toronto. 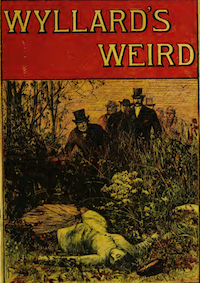 The Thomas Fisher Rare Book Library of the University of Toronto offers a nice online collection of cover images from Victorian yellowbacks—most notably from works by Canadian-born Grant Allen (mystery writer as well as friend and neighbor of Arthur Conan Doyle).